Those Greek gods you read about in school? The scheming, philandering, manipulating, moody gods you learned about in your textbooks? Still alive and well in the comic book world. Both DC and Marvel have their own set of Greek deities, with the only real difference between the two sets is the Marvel ones tend to be sillier. 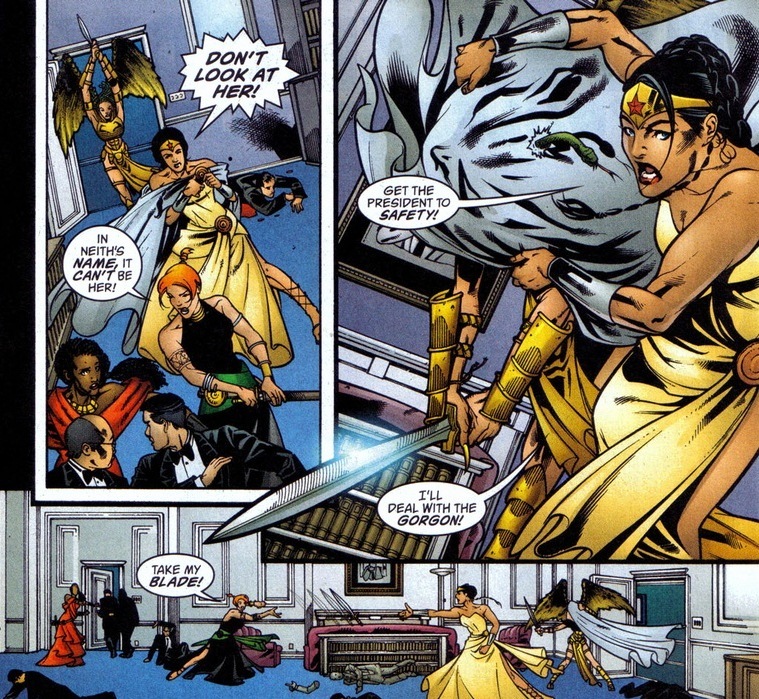 Wonder Woman (aka Diana Prince), being an Amazonian princess from the mythical city of Themyscira, has her roots plowed deep in the DC god realm. She’s Athena’s champion, brawls with Ares, employs a Minotaur chef, and among others. 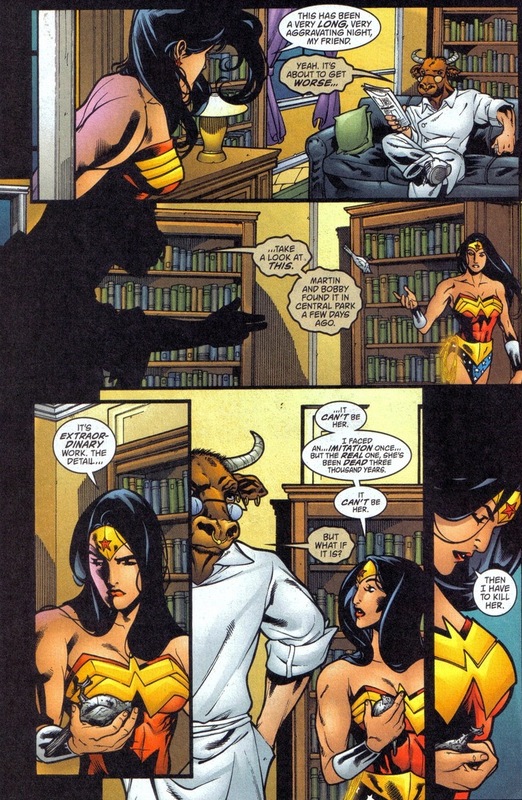 During writer Greg Rucka’s run on Wonder Woman, he deeply and magnificently explored Diana’s relationship with those immortal troublemakers. 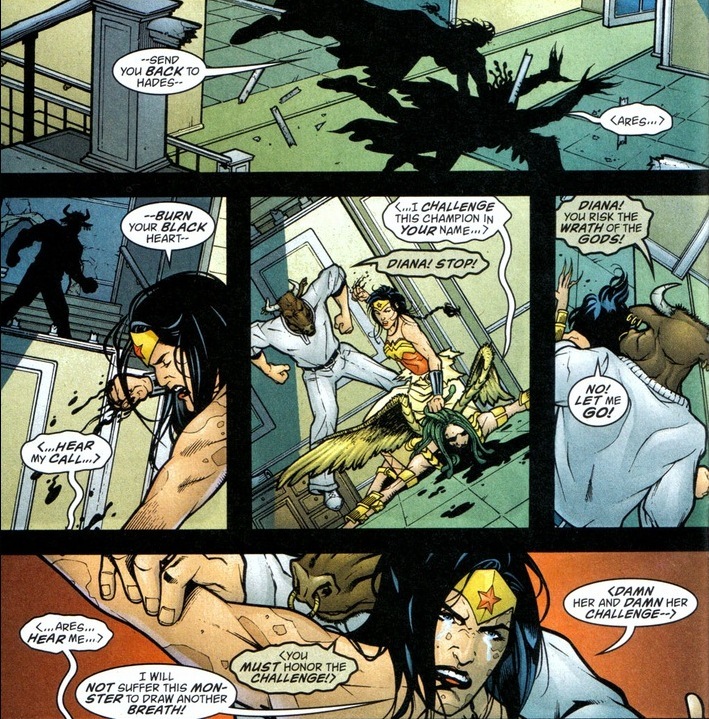 But none of her experiences became as brutal as Wonder Woman #205-211, volume 2, drawn by Drew Johnson and Sean Phillips. Y’see, being Athena’s champion certainly has advantages, the ear of a magical goddess for one, but every once in a while, the downside rears its ugly snake-hair head. 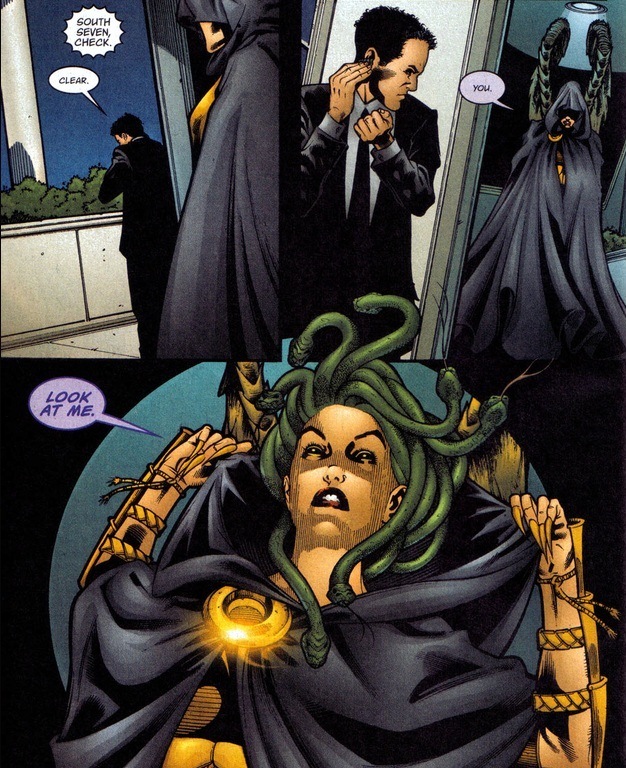 If you don’t know Medusa’s origin, she was once a super pretty priest of Athena. Until Poseidon caught a glance and decided he wanted some of that. Despite the, uh, forceful nature of Poseidon’s advances, he swam off scot-free and Athena’s rage turned Medusa into that bitter, violent, and single-glance-turns-you-to-stone gorgon we know and love. Bad deal for Medusa. Even worse when the Greek hero Perseus snuck into her lair one night and sliced off her head. Well, thanks to the witch Circe and the bumbling gorgon sidekicks, Medusa’s back! 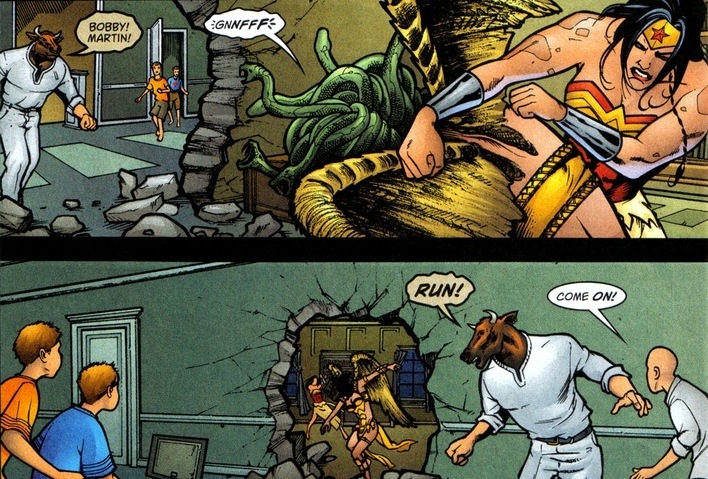 What’s Medusa’s beef with Wonder Woman? 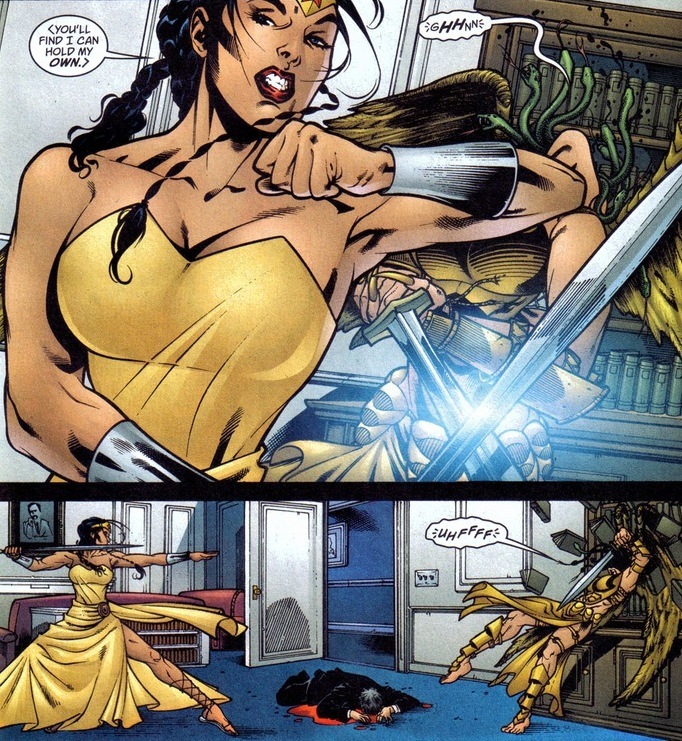 Y’see, after Poseidon’s, uh, breaking and entering, she became his own champion. In the DC world. Certainly not the Greek world. Plus Athena and Poseidon have had a beef going on for the past several thousand years. Seeing how the mortal Medusa can’t kill the goddess Athena, the champion will have to do. Unfortunately, Medusa rotted for a good 3,000 years before the scantily dressed sorceress resurrected her. Things have changed. Like cars and stuff. 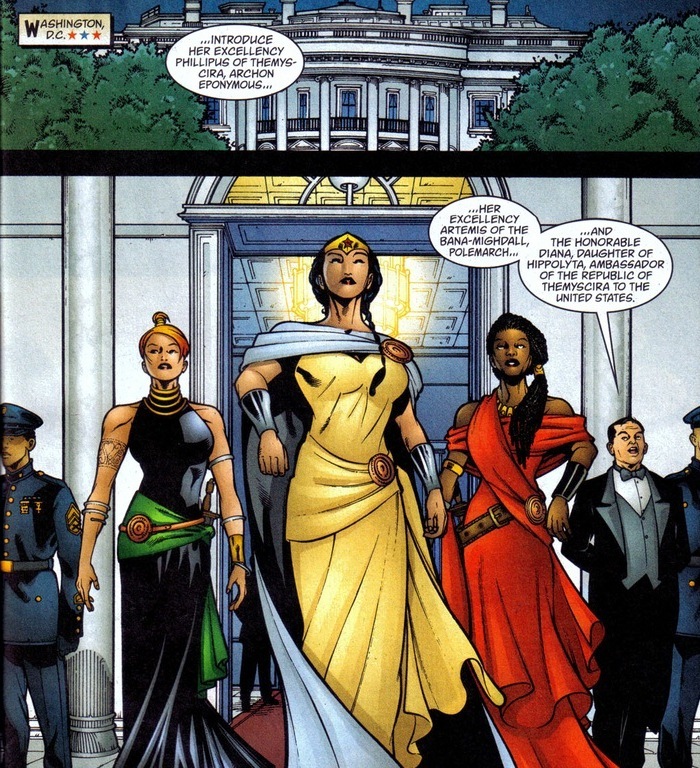 So in hopes of some modern help, Medusa goes to an old enemy of Wonder Woman, the billionaire Veronica Cale. 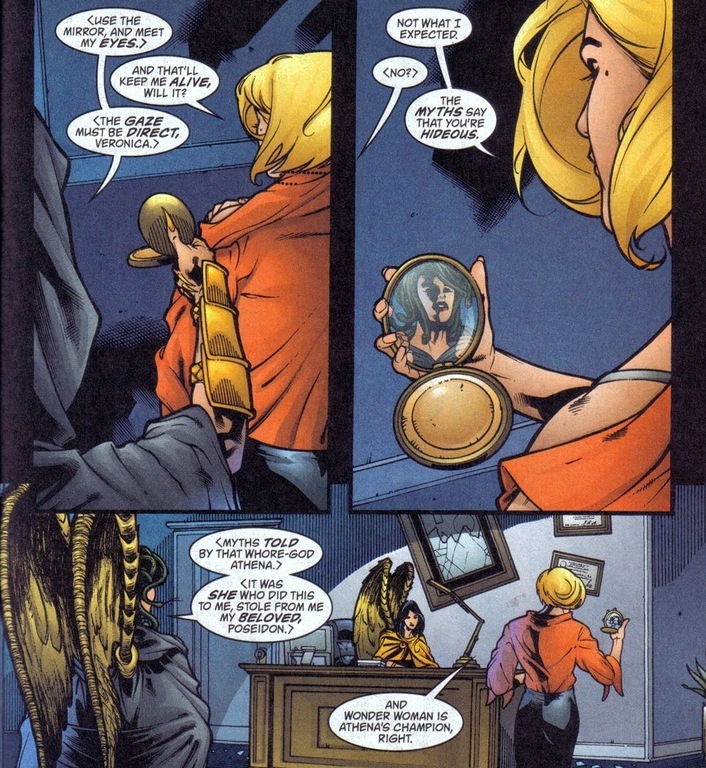 Think of her like Diana’s Lex Luthor. 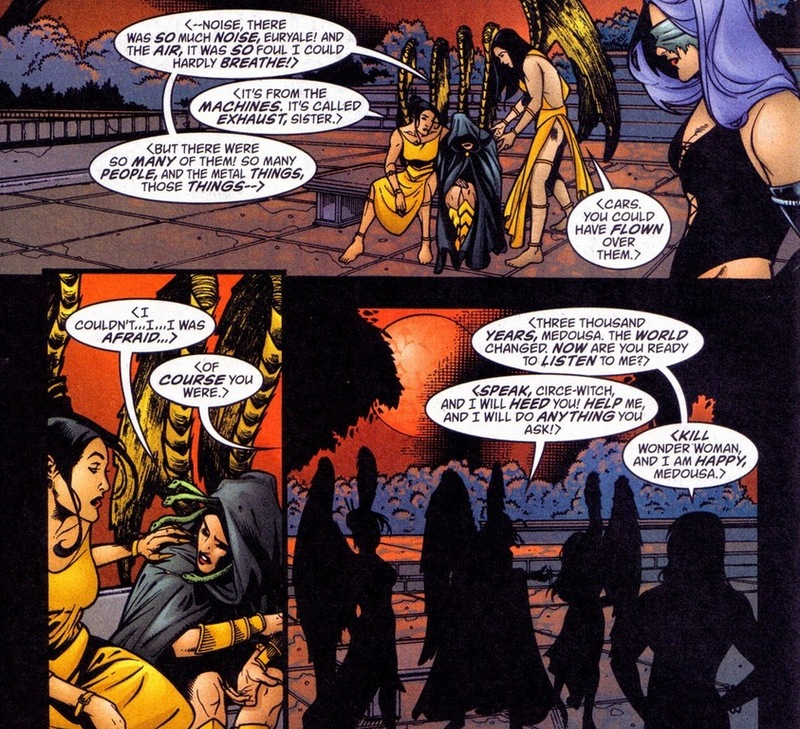 Veronica finds out where Wonder Woman’s going next and directs Medusa there. Easy enough. Back at the embassy, Ferdinand the Minotaur comes across a sculpture that sends fear from the tip of his bull-horns to the bottom of his man-toes. The stage has been set! 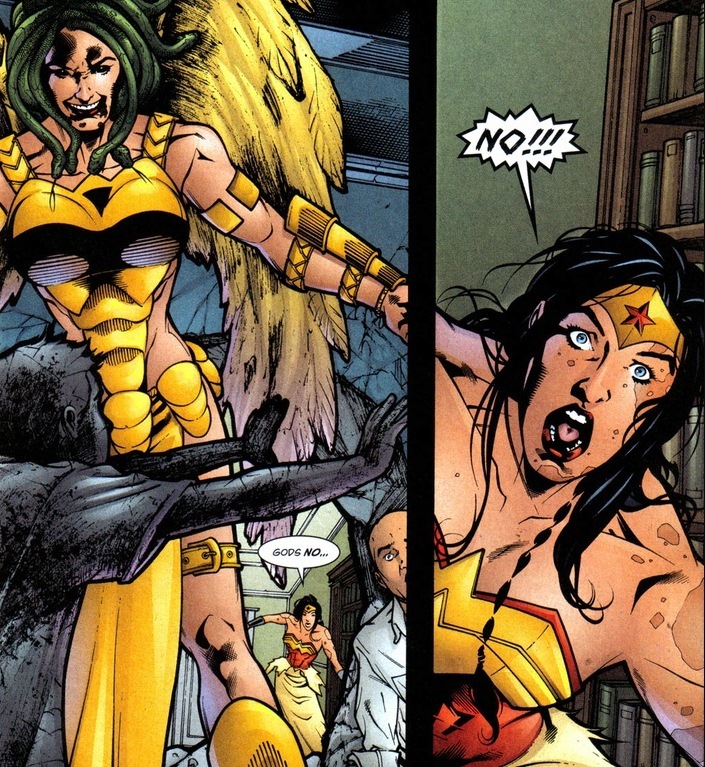 We know Medusa plans to ambush our Justice League-er the next time she pops her head in public. Where could that be? The Fortress of Solitude? A totally abandoned warehouse dock? The battles between the two champions take place over three separate bouts, each with more at stake than the last. Though hard to top a first fight in the middle of the White House wearing a formal dress against an opponent she can’t look at. Not exactly a spectacular defense. Look, before you wonder why Medusa fled the party just as she gained the upper hand, I’ll give two reasons. 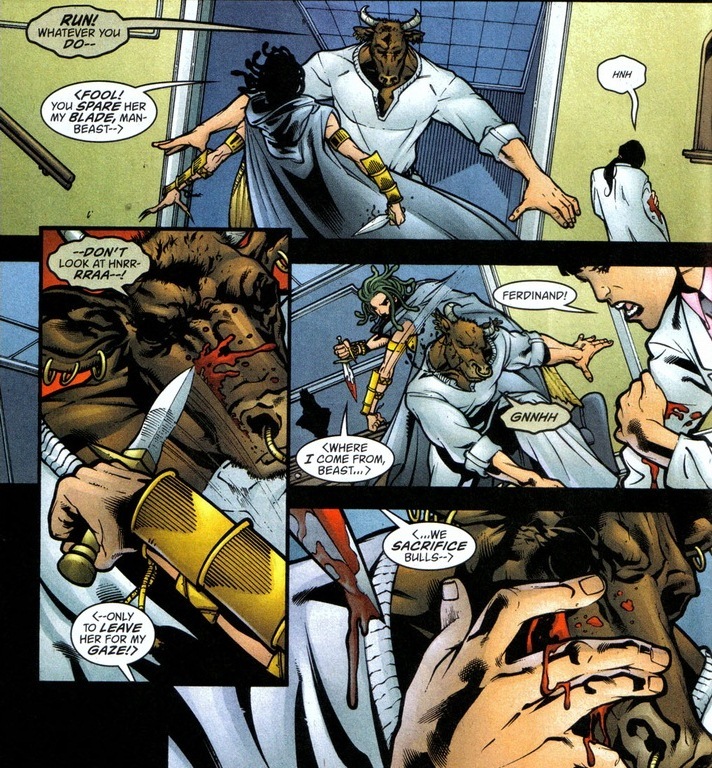 First, she plans to hurt Wonder Woman’s friends and family before she kills the lady herself because she’s that’s what psychopathic monsters do. 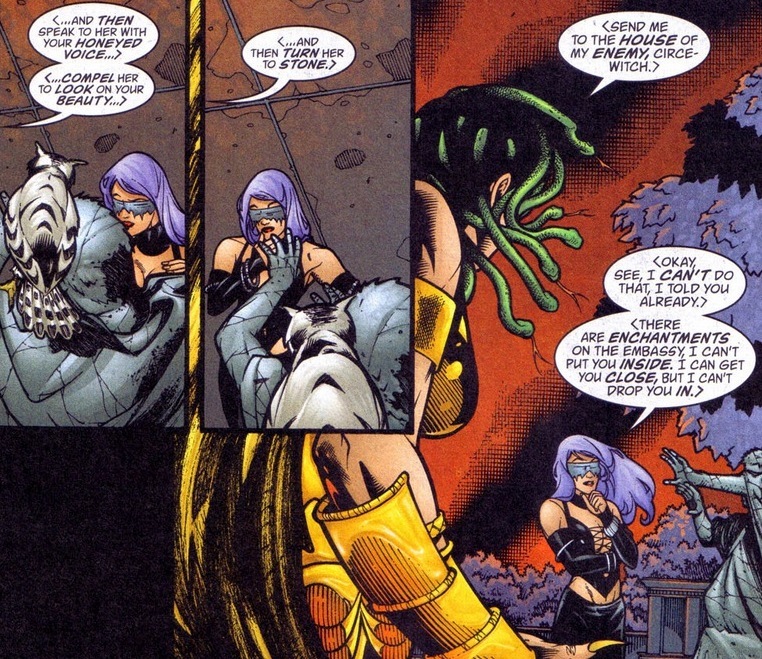 And second, Medusa’s totally vulnerable to bullets and stuff, especially in that battle bikini. Maybe she could stone an entire SWAT team before they get to her, but why take the chance? Plus, Minotaurs, office clerks, and young children are far easier to kill. You think a nice evening schmoozing with the Washington DC elite would be a lovely time of hors d’oeuvres and engrossing policy talk. Nope, a gorgon monster always has to turn all the Secret Service to stone and ruin things. 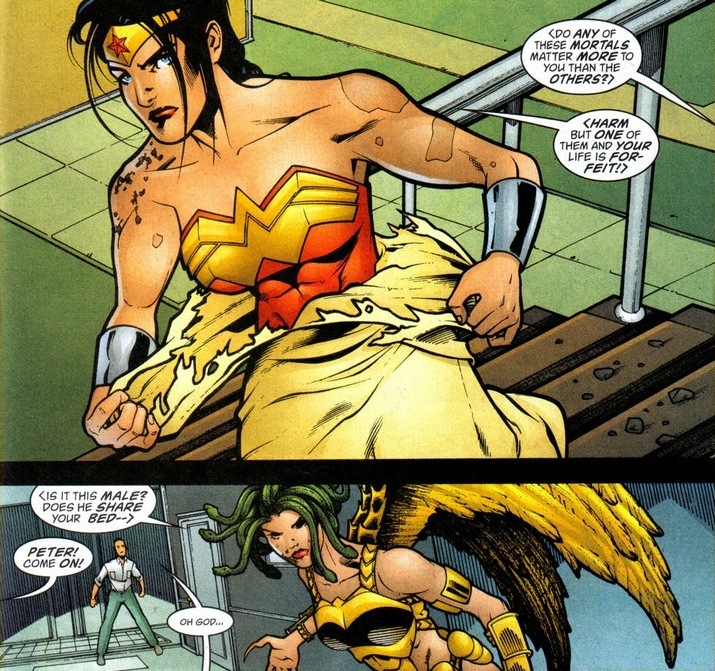 Well, poor Wonder Woman’s evening is already down for the count and you’re about to witness the sucker punch. 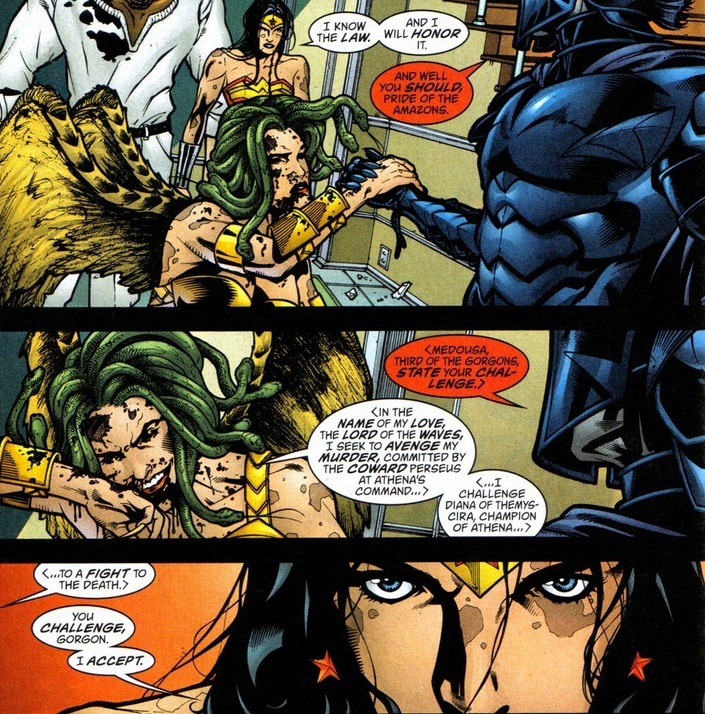 Faced with a bloody mauling by the most powerful woman in the DC universe, Medusa invokes ancient law that Wonder Woman has to follow. Gods and goddesses and all that, you know? Feast your eyes on Ares’ cool armor too. With the duel agreed upon, we’ll pause until tomorrow when Wonder Woman takes on Medusa for the fate of the whole world. Exciting, right? If you like punches, you’ll love part 2. A person essentially help to make seriously articles I would state. This is the very first time I frequented your website page and thus far? I amazed with the research you made to create this particular publish amazing. Magnificent job!